Only compromise offers a way out of the current impasse. The upcoming meeting of the European Union's heads of states and governments, to be held on June 25-26, is unlikely to bring anything new for relations with Russia. Existing sanctions against Russia will likely remain, though no new ones are expected - unless fighting flares up again in south-eastern Ukraine and Moscow can be blamed. 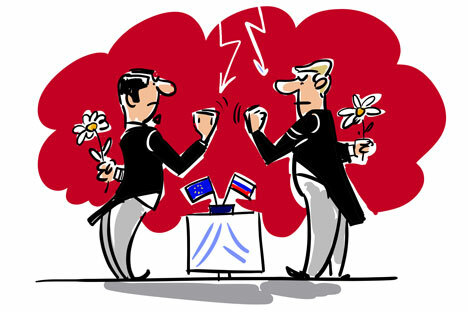 Leading EU countries, especially Germany and the UK, want to maintain pressure on Russia. But they have to take into account the apparent reluctance of some EU countries, particularly Greece and Cyprus, to tighten sanctions. There is also a certain fatigue in the EU with the current Ukrainian authorities - demanding yet more aid, but failing to heed the advice of “European friends,” especially on the implementation of the Minsk agreements. And the EU understands that Russia is still needed to help solve pressing international problems, such as Iran's nuclear program or the advance of ISIS in Syria and Iraq. It seems that chilly relations between Russia and the EU will not warm up soon, since the causes are not only rooted in Ukrainian events. Rather, the Ukrainian crisis itself is, to a certain extent, the result of growing contradictions in relations. For many in the EU this looks attractive - and is one of the key factors in the growth of its 'soft power' policies. And just like any other empire, this approach eventually began to push Russia back. Ukraine is a prime example: For the first time in its history, the EU openly backed the prospect of “Euro-integration” for a country that utterly failed to meet its accession criteria. The expansion of the EU was from the very beginning supported by the U.S. as it sought to limit the possibility of Russia's revival as a great power. That is why Washington attached such special importance to Ukraine's integration into the EU and, in the long term, NATO. The loss of Russian influence in Ukraine would seriously weaken its position throughout Europe. The role played by Germany is also significant. As its influence and power within the EU has increased, so too has its historic interest in Ukraine. The confrontation between Russia and the EU – and the West in general – over Ukraine is here to stay. Having seized Crimea and backed the self-declared rebel Donetsk and Luhansk people's republics, Russia has signalled its determination to stop the expansion of the EU and NATO into the post-Soviet space. That move effectively throws down the gauntlet for revising the entire international order established in Europe following the collapse of the USSR, which failed to take Russia's interests and opinions into account. Naturally, the West, which feels stronger, especially in economic terms, is trying to prevent any revision to the post Soviet order by putting economic, political, diplomatic and psychological pressure on Russia. History shows that such situations are resolved either by war or by compromise. As the prospect of war with a nuclear power causes concern even for American hawks, the parties must sooner or later come to a compromise. That will require concessions from both sides. The nature of these concessions will depend primarily on the extent to which Russia bends - or not - under pressure of economic and political sanctions. In the long term, the development of a new working relationship is inevitable, since Russia and the EU need each other both economically and in terms of ensuring security on the continent. The idea of creating a single economic space “from Lisbon to Vladivostok” recently voiced by Angela Merkel, but earlier put forward by Russia, underlines this. It is clear now that the crisis in Ukraine can only be overcome by joint efforts. Russians in general belong to European culture; few contest that. More and more Europeans understand the current friction benefits certain third parties - specifically the U.S. - but does nothing for our peoples. There is no alternative but a patient approach to creating the conditions for a new rapprochement. The author is a consultant to the Council of Europe, Doctor of Law, Envoy Extraordinary and Plenipotentiary.